Studio H Landscape Architecture, Inc. made the client’s desire to have a backyard sanctuary possible. It is the perfect place to spend quiet mornings and relax at the end of the day. 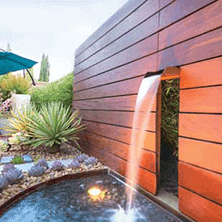 For this backyard sanctuary, an ipe fence camouflages a concrete block wall which serves as an attractive backdrop with water flowing from a scupper to a steel-trimmed catch basin. Adjacent to the basin is a boulder, rock, and fine gravel Zen garden. Much of the landscape design layout was intended to be enjoyed from inside the home. It is exquisitely designed to relate to various viewpoints from inside and outside the home.